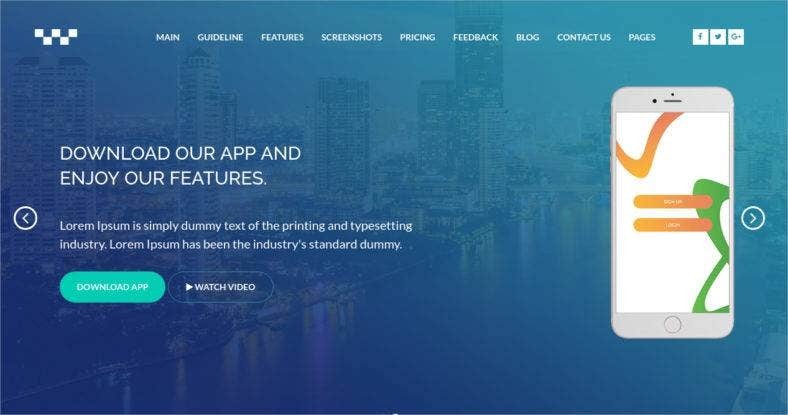 Impress your clients and encourage them to download your mobile and web apps with this collection of landing page themes and templates. Mobile and web apps have been gaining a lot of attention ever since the beginning. Yet, they still have no plans of slowing down as more and more individuals and organizations continue to churn out every kind of app conceivable. With the fierce competition in the market, it is also essential for these companies to present and market their products in an interesting and spectacular way. 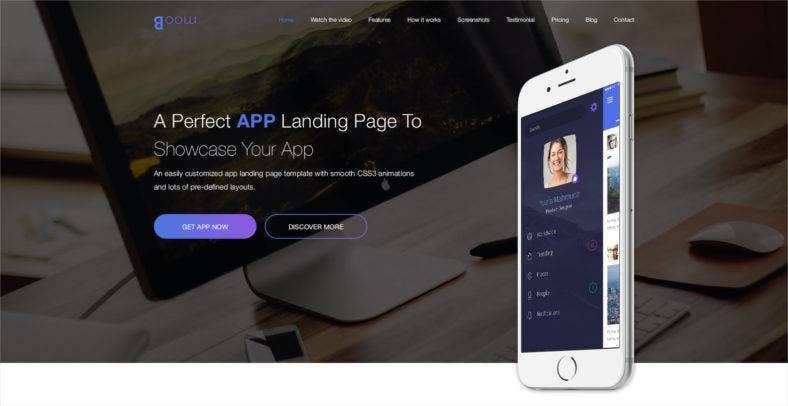 So, here is a collection of the best web and mobile app landing pages that you can use to introduce and promote your app products to the eager market. With these themes, we guarantee that your mobile apps will gain the viral status it deserves. Angle is a responsive app landing page template that is powerful enough to present your app in an amazing way. It is very well-organized giving you an easy way to customize your web page according to your needs and preferences. This theme has a clean and professional that is fully responsive and cross-browser compatible so it works well on any device or screen. 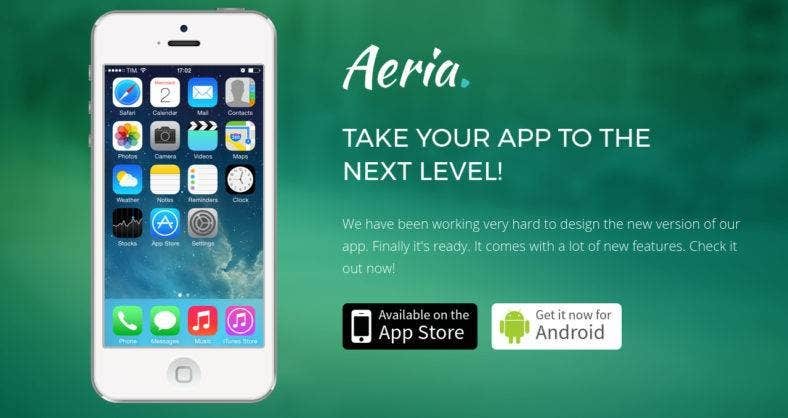 Aeria is an app landing page made with the Bootstrap framework. Therefore, it is packed with awesome features like a responsive layout, full-screen backgrounds with slideshows, working Ajax email subscription and contact forms, Font Awesome icons, and much more. 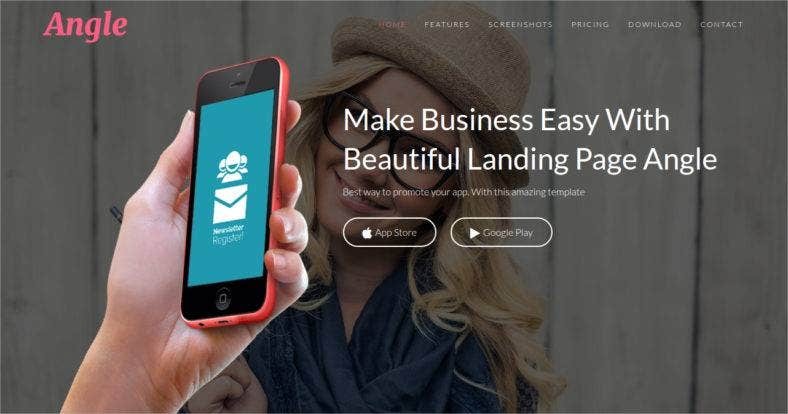 It is the perfect landing page that will surely take your apps to the next level. Above is a creative HTML5 landing page template, Xhafia. Along with its unique name, this theme also offers a clean deisgn and well-organized layout to give your users an amazing user experience. It comes with a smooth scrolling one-page parallax effect that is visually stunning. Other features include multiple icons, pricing tables, and a responsive Navbar Menu. Quite a template to be reckoned with, Intense is a unique mobile app landing page theme that is great to use for startups, small businesses, and other projects. It features an etraordinary pullout menu, conversion-optimized layout, animated CTA buttons, and fully functional web forms. The theme is also easy to customize so your landing page can adapt to your brand easily. Another creative app landing page template is the clean and modern theme above. 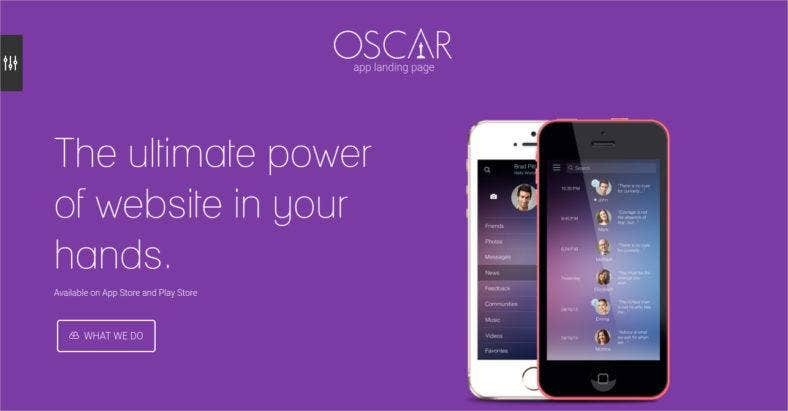 Oscar provides a flexible layout and a well-organized design that is easy to modify to how you want your landing page to look like. It is built upon the Bootstrap3 framework and is loaded with powerful features, making it a great theme for mobile apps as well as web apps. App Launch is an app landing page HTML5 template with a one-page web design and a blog page layout to build a single product landing page. It comes with 7 color scheme options, an image header or Youtube video background, owl carousel, linear icons, and google fonts. All these will help you create a functional and good-looking landing page or web design. 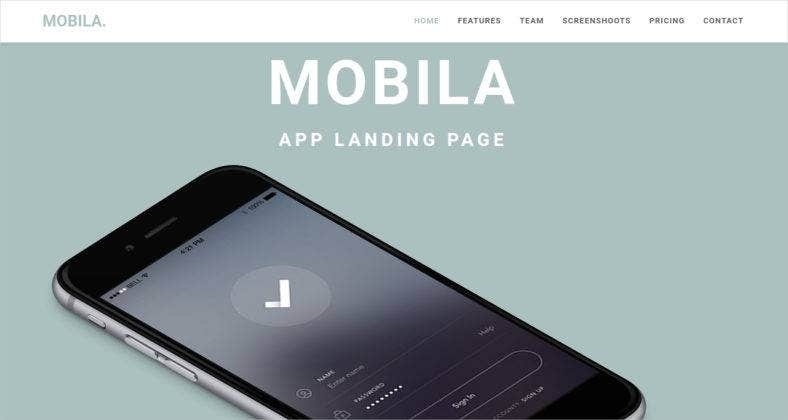 This mobile app landing page template is a free and responsive theme especially and suitably made to promote your mobile app products. Smart App has a clean and simple design that is well-structured and very easy to customize and personalize. It is also mobile and SEO-friendly and integrated with an email subscription box for digital marketing purposes. Nova is another responsive app landing page theme with a simple yet modern style and design. It is an HTML landing page template that is made with the Bootstrap framework and offers high flexibility and customizability. It is easy to work with and guaranteed to give you a gorgeous and functional landing page in no time. Perfect for any mobile app and other digital products. Boom is a mobile app landing page PSD theme that features 4 layered PSDs with unique designs to build your landing page. It features a unique and modern style, with 1170px grid system and a pixel perfect design in a responsive layout. Along with other dynamic features, this template will surely make your landing page look great on every device. This minimal landing page theme is based on HTML5 / CSS3 and Bootstrap framework, which includes mockup PSD files for easy customization. Mobila offers a clean and sophisticated design aesthetic that is perfect for any startup business or corporate company. 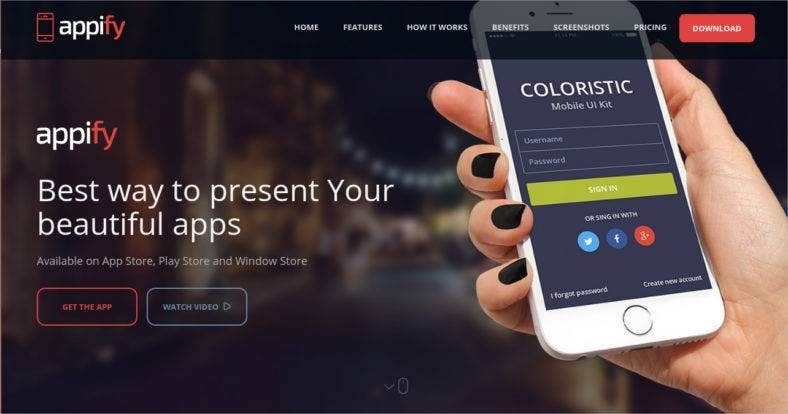 Showcase your apps, whether mobile or web, with this theme that all your customers will surely love. 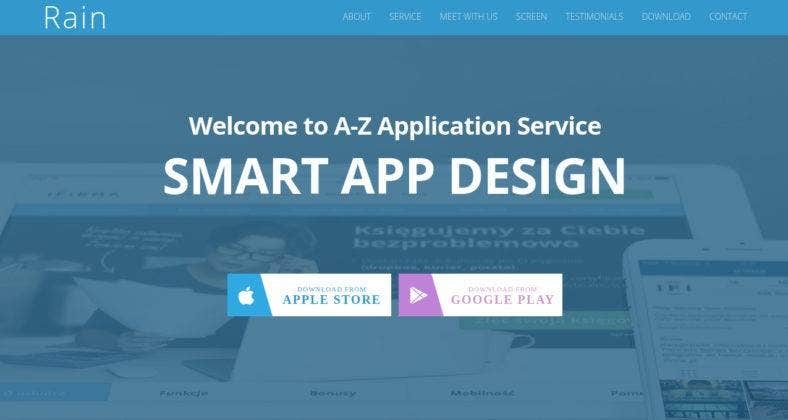 Appify is a modern and creative mobile app landing page template that comes with a one-page layout for multiple purposes. This theme can be used to display mobile app products from the three popular platforms: Android, iOS, and Windows. It is also built with LESS, CSS3 and HTML5 codes for easier customization. Great for launching your app’s marketing campaigns. Rain is a free mobile app template that comes with a responsive and smart app design. Impress your potential customers with a fantastic landing page design that introduces your mobile games and apps in an incredible way. This template comes with a unique and creative design, excellent background images, and gorgeous typography that will surely increase the downloads from your page. 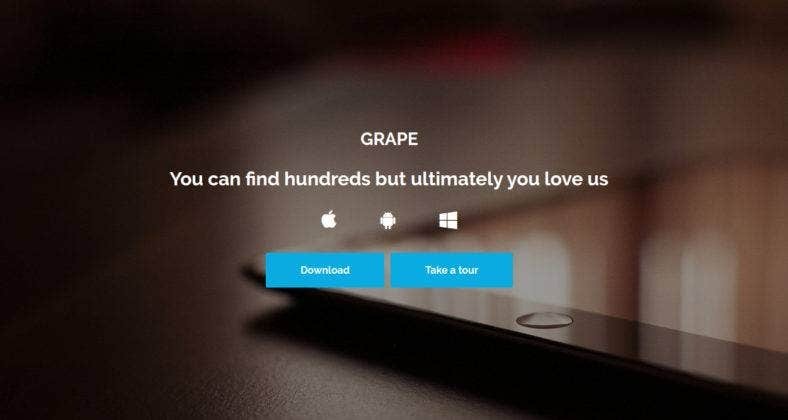 Grape is a responsive HTML5 app landing page theme that gives you a beautiful one-page website template with parallax effect in order to create a striking landing page. It comes with a bunch of features such as Google Fonts and Font Awesome icons which are easily customized and modified. It is also integrated with Ajax contact forms and Mailchimp for marketing. 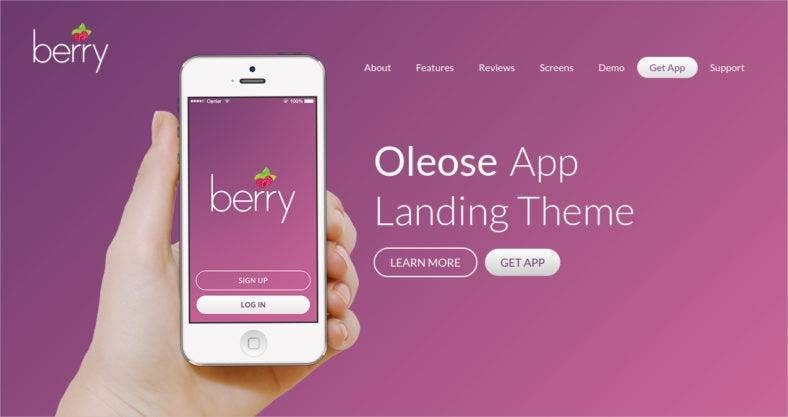 Oleose is an eye-catching mobile app landing page theme the has a clutter-free layout that is perfect for corporate and personal apps. It comes with 3 theme options that you can choose from to create just the right landing you need for your apps. The theme is easy to setup, has a dedicated support, and is free. You’ll never regret choosing this creative landing page template. Dodge is a multipurpose app landing page template that features a clean and simple layout that’s great for highlighting your content. It comes with 3 homepage variations, 2 header variations, and 2 footer variations that help you create a website appropriate for your brand. Integrated with Ajax Contact Form and MailChimp to simplify your marketing strategies. A landing page is an essential marketing tool for businesses. It provides companies and business owners the perfect way to reach out to their niche market and sell their products. So, make sure to get one of these landing page themes for you mobile and web apps. And while you’re here, you can also check out or collection of premium landing page themes and templates for your inspiration.